Helen has integrated the comforts of western modernity and design with the cultural heritage of the Himalayas and the Northeast. At The Bamboo Retreat intercultural learning is an ongoing process – customer satisfaction, aesthetics, hygiene, ecological and social soundness here are a high priority. Carefully laid out according to the principles of Feng Shui the retreat has its own gardens and 12 individually decorated rooms following the themes of the elements – Water, earth, wood, fire and metal. From the secluded comfort of your own private balcony, you can enjoy the panoramic vista of the city of Gangtok with the Himalayas towering in the background. In the evenings you can relax with a cup of tea and a good book while the chirping of the birds and the tick ticking of the insects from the forest all around will be the only sounds you’ll hear. 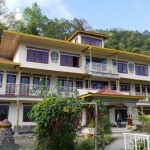 The dining Hall offers local Sikkimese as well as Indian, Chinese and even Italian cuisine. You can meditate in the traditional prayer hall, take guided village and monastic walks, interact with the villagers or relax in a refreshing herbal bath made from homegrown fresh herbs. Location: The Bamboo retreat is located village of Sajong in East Sikkim, just 24 kms from Gangtok amidst spectacular views of Sikkim’s green rolling hills and the snow-capped Eastern Himalayas. 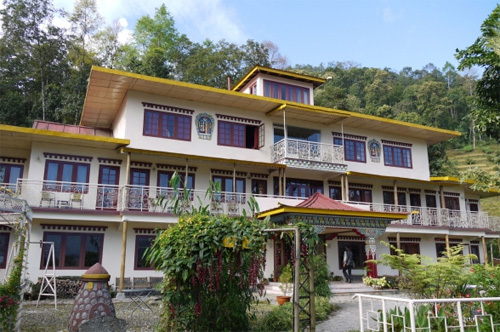 With the Rumtek Monastery nearby, Sajong village is a tranquil sanctuary that can offer you the ultimate seclusion. Rooms: Each room at Bamboo Retreat has its own individual character and is decorated in various colour-themes according to the elements as taught in Feng Shui. Most come with balconies providing stunning, panoramic views of Nathula and the Eastern Sikkim- Himalayas towering behind the city of Gangtok. Our apartment Emerald is spacious and ideally suited for honeymooners, families or guests preferring spaciousness, privacy and quietness. Please note that the Bamboo Retreat is non-smoking inside. However, guests can smoke in the garden or on their balconies. We do not provide televisions in the rooms as we believe that the essence of your purpose of visiting is lost if you stay spending your time watching TV. We do however have a common room with a television. – Panorama Restaurant with Pizza-oven and Bar: With ethnic, Indian, Chinese and Italian cuisine freshly prepared with seasonal vegetables and herbs. Wellness treats at The Bamboo Retreat include regenerating herbal baths, the freshly brewed herbal teas, meditation and Ayurvedic massages by a trained Ayurvedic Doctor or his assistant. Meditation-classes guided by a local monk are also available upon request. Please note that Credit Card-facility is not available. However there are ATM’s at Ranipool and Gangtok for withdrawing cash. Dine and Wine: Bamboo Retreat’s Restaurant is furnished in a combination of traditional Sikkimese-style and cane-furniture. The curtains and table-sets are made of Bhutanese-style and Lepcha textiles and bamboo-items from the entire northeastern region decorate our walls. The Dining Hall can seat up to 30 persons and there are provisions for more sitting in the outdoor garden-area. At our bar you can try Sikkim’s popular Blue Dansberg-beer or go for a locally produced Whiskey or Cherry Brandy. The bar also serves a variety of Indian wines. Yet if you desire a true introduction to the world of local drinks you cannot leave Sikkim without having tried the local millet-beer, ‘Thungba’. Fermented millet is poured into a large bamboo- or wooden cup. Then hot water is added and left to absorb the taste of the millet. ‘Thungba’ is drunk warm with a bamboo-straw and tastes ‘somewhat’ like Japanese ‘Sake’. Things to do: Enjoy a nature walk while exploring the village of Sajong and Rumtek. You can also rent a Mountain bike to move around the area. Two days guided treks are also arranged to Tinjure Ridge, from where you can savor the majestic view of the third highest Mountain of the world, Mt. Kanchenjunga. Visit the local Buddhist monasteries along with local guides. You can also arrange for picnic at the nearby locations. Many tourists also indulge in swimming at Ray Khola mountain-river. The capital city of Gangtok, just 24 kms from Sajong is admired with a number of tourist attractions, which you can visit by arranging day trips from Sajong. Some of the major nearby attractions are Tibetology Museum, Do-Drul Chorten, Orchid Exhibition, Enchey Monastery, Tsomgo Lake, Phodong Monastery and handicraft and Handloom Industries.